Activate your Star Wars Celebration Badge Today! To activate your badge or manage an existing activation, please enter your activation code below. This badge has already been activated. Please enter the email address you used at activation to proceed. We could not find that badge. Please check your activation code and try again. It's your mission to earn points for your side of the Force during Star Wars Celebration! Earn points for your side of the Force by interacting with Amazon Prize Stations, complete secret missions on the Star Wars Celebration Mobile App (coming soon!) and find hidden QR codes throughout the event! UNLOCK EVEN MORE AT STAR WARS CELEBRATION! WHERE IS MY BADGE ACTIVATION CODE? 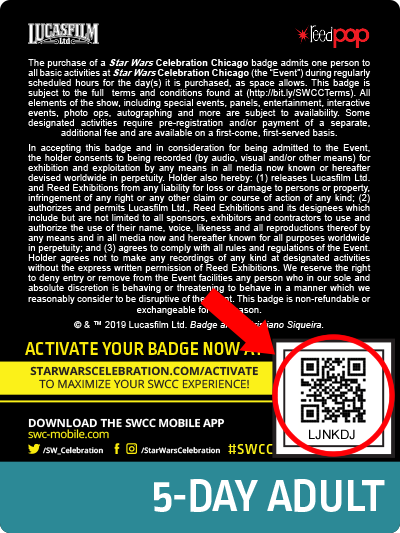 Your activation code can easily be found on the back of your Star Wars Celebration Chicago badge. Simply enter the code under your QR code into the space above and click lookup to begin the badge activation process! Activating your badge will maximize your experience at Star Wars Celebration Chicago and open up a galaxy of fun and excitement for you.